The more observant visitor to Three Cornered Copse will notice that, some months before, the aging sign erected by "The Borough of Hove" many years ago has been removed from the lower entrance. The notice carried about 3,000 words informing the reader of the rules and regulations when using the park, and others around the borough, to ensure a safe and lawful experience of the town's green spaces. Today we'd be a little sceptical of an information board instructing us on how to use a park. Our views have changed, and today's park information boards inform about ecology, wildlife, species of butterfly and birds, and perhaps a drawing showing us how to recognise a badger. Our colleagues in other groups - Green Ridge, for example - have had such a board for several years, carefully designed to educate, inform and entertain. And without doubt, they work. The board says that Green Ridge is a beautiful place with a diverse ecosystem, cared for and used by a dedicated group of people, and serves to enhance the experience of the casual visitor. Which brings us to the task of designing a pair of information boards for Three Cornered Copse. 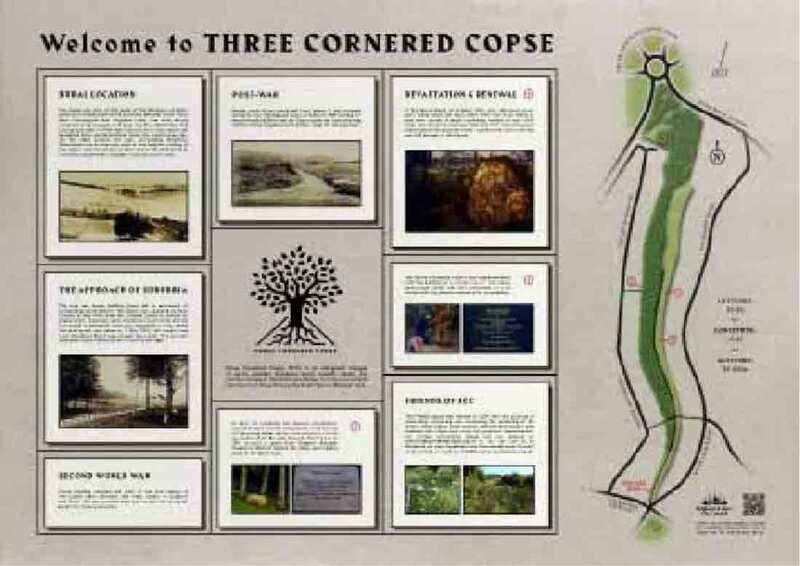 The first board shows the layout and boundaries of the copse with several items highlighted, explaining the background to some of these. For example, the Coronation Stone, installed in 1953 for the Queen's ascension to the throne, and the subsequent renovation work. In our city we are blessed with the James Gray collection of photographs held by the Regency Society, which has many early photographs of the copse before the suburb surrounded this patch of woodland. These will be useful to show the changes through the years. The copse, of course, was decimated by the storm of 1987, and this event is also remembered. We move slowly, so look out for the boards appearing later in the year, not only an information board, but a genuine "Jamie Eke Design".